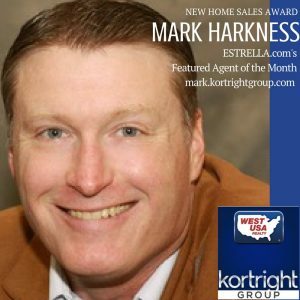 Estrella.com “New Home Sales Award – Featured Agent” is Our Very Own Mark Harkness! Mark is currently our top performing buyer’s agent and specializes in new home construction. He has done an amazing job educating himself on the differences between different builders, communities, floor plans, upgrades etc. in order to provide a type of concierge service to his buyers. To reach Mark, please feel free to visit Our Agents. Call Mark or any of our buyer’s agents prior to visiting new home communities. Here’s why. Search Goodyear New Construction Homes for Sale.